Sugar Mountain Resort is located in the beautiful Village of Sugar Mountain, right off of Hwy 184. Sugar Mountain also boasts the largest vertical drop (1200 feet) in the state. The Sugar gets sweeter! This year expect faster lift lines over on the Red Lift, with a new drive station and new chairs, you’ll be riding in style to the top of the mountain! Already sweet terrain will be maintained by three new Piston Bully machines, including one Winch Cat, so no matter where your skis or board take you, expect only the best groomed conditions out there! The arsenal of snowguns at Sugar Mountain has grown, as well! With 1,500 new feet of snowmaking pipe upgrades and six new energy-efficient snowmaking machines purchased combined with cold temperatures, snow will abound! Added in 2007, Sugar Mountain offers a 10,000-square-foot refrigerated outdoor ice skating rink! The ice skating rink is tentatively scheduled to open on Thanksgiving day with 6 daily sessions. Skate sessions are 1 ¾ hours long and are available at 10:00 a.m., 12:00 p.m., 2:00 p.m., 4:00 p.m., 6:00 p.m. and 8:00 p.m. Three hundred pairs of rental skates are available. Special session bookings can be accommodated upon request. 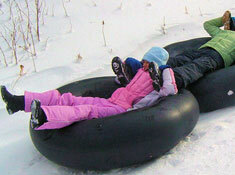 The ice rink is located adjacent to parking lot D and the Tubing Park. Sugar Mountain is the largest ski area in North Carolina by about 20 acres (total of 115 acres of skiable terrain). 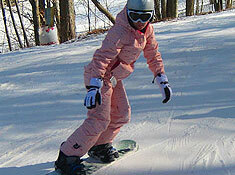 The popular mountain offers some great stay-and-play ski packages with area lodging companies. The lodge at the base of the mountain offers ski and snowboard rentals, cafeterias, a lounge, a sports shop, a locker room and a gift shop. Sugar also offers snowshoeing (unique to the area), a snowboarding park that is closed to skiers, and a 700-foot-long tubing park that is fun for the whole family! Sugar Mountain may offer some of the most dramatic panoramic views from atop their mountain. The ride to the top is notoriously slow, however it is worth every minute as you will experience some of the best views in the region. SkiSoutheast.com andSkiNorthCarolina.com have long advised visitors to the area about Sugar Mountain’s great beginner terrain. Easy Street, which is somewhat segregated from the main slopes, offers a gentle grade that is perfect for new skiers and snowboarders. Also, for those who are a little “anxious” about riding high chairlifts, you will love the lift on Easy Street, as it will allow you to get acclimated for when you’re ready to move up to more challenging trails. Advanced skiers will want to try Tom Terrific, Boulder Dash and Whoopdedoo, which are all favorites for more experienced skiers. Whoopdedoo is the only double-black diamond trail in the area. Sugar Mountain’s racing program includes weekend NASTAR races and highly competitive invitational races. There are many types of races scheduled during the season for competitors and spectators. Snowboarding comps, youth racing and more. The perfect place for adults to end a day of fine skiing is within the Last Run Lounge, located in the base lodge. They offer all of your favorite adult beverages and you can hang with your friends and perhaps even make some new ones. The Last Run Lounge offers televisions (usually showing the weather channel or sports), great snacks and a warm fireplace.